Jesse is now a full-time engineer at NASA’s Jet Propulsion Lab in Pasadena, Calif. When Jesse Mendoza began school as a first-generation student in his family, the possibility of working in the space exploration business was difficult to envision as a possible career path. Today he is a full-time engineer at NASA’s Jet Propulsion Lab in Pasadena, Calif.
For many students like Mendoza, without opportunities like NASA’s Minority University Research and Education Project and MUREP Institutional Research Opportunity, it can be incredibly difficult to find the professional connections and educational support needed to move into the fields of Science, Technology, Engineering and Mathematics. MIRO, an integral part of MUREP, is managed by the NASA Armstrong Flight Research Center’s Office of Education and supports partnerships between NASA and Minority Serving Institutions. MIRO was established to strengthen and develop the research capacity and infrastructure of MSIs in areas of strategic importance and value to NASA’s mission and national priorities. It promotes STEM literacy and to enhance and sustain the capability of institutions to perform NASA-related research and education, directly supporting NASA’s four Mission Directorates. Through this unique partnership, MSIs are eligible to submit proposals to MUREP activities like MIRO to obtain multiyear research awards that will help strengthen and develop research capacity and infrastructure. This past year, Mendoza, along with MIRO alumni Nelson Garcia, Sirina Nabhan and Brittany Seto, began their careers as emerging engineers at JPL. Mendoza, Garcia, Nabhan, and Seto were in attendance at the University of California, Riverside in 2015, when the University’s Fellowships and Internships in Extremely Large Data Sets center was one out of ten institutions selected to receive MIRO funding. As both an MSI and a renowned research university, UCR is filled with students exploring potential futures in STEM. 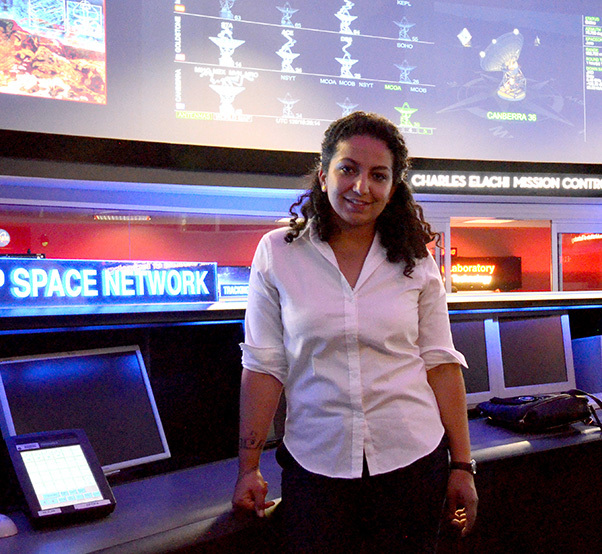 Sirina Nabhan is seen working in the Network Operations Control room, more famously known as “The Dark Room.” The NOC is responsible for routing science and engineering data to the owners of each spacecraft. “UCR was full of many students like me — first-generation students who did not initially have professional connections or know exactly what we wanted to do, yet were driven to make a positive difference in our communities.” said Mendoza. Through the MIRO activity, 19 interns from UCR were given the chance to participate as student interns at JPL. Through these internships, the students networked and developed professional relationships at JPL — gaining the skills necessary to bridge the gap between being a student and becoming a professional engineer. “As an intern I had a wonderful tour of the telecommunication building where I first learned, in detail, about the Deep Space Network. Having gone through this experience, I knew about the DSN when asked at my full-time interview!” Nabhan said. MIRO funding lasts up to five years, but for NASA’s Education group, the impact extends further. Maria Weld, NASA’s MIRO education specialist, said “We want them to achieve their program goals and objectives beyond MIRO funding.” Programs like NASA’s MIRO activity provide NASA-specific knowledge and skills to learners who have historically been underrepresented and underserved in STEM and help the agency diversify the workforce. 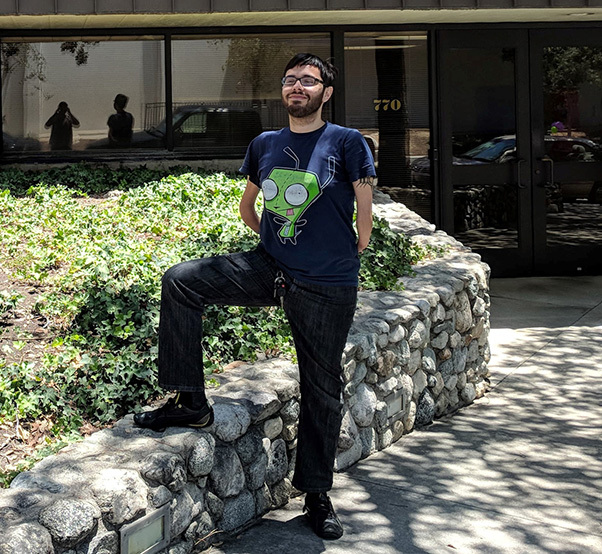 Nelson Garcia is posing in front of the David W Morrisroe Astroscience Laboratory, home of the Infrared Processing and Analysis Center at Caltech. IPAC partners with NASA, the National Space Foundation, JPL and the world-wide research community to advance exploration of our Universe. Through these types of NASA-driven experiences, what once seemed impossible has now become reality for these young professionals. 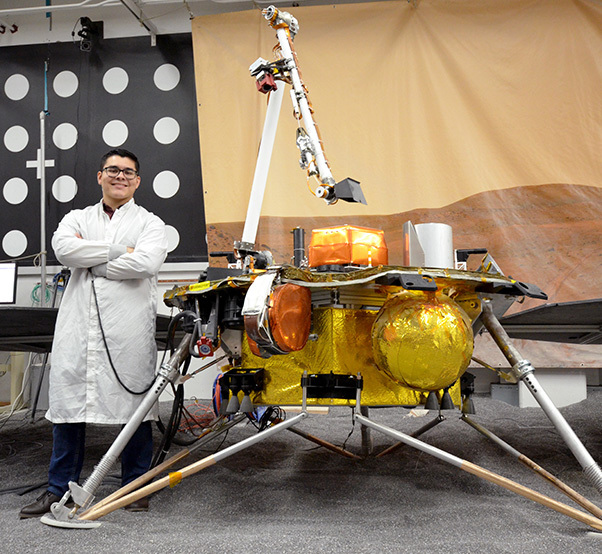 Mendoza is a NASA mission operations systems engineer for the InSight mission to Mars. Nabhan is a critical event planner and a network operation analyst for NASA’s DSN program. Garcia is an applications development associate for Caltech’s Infrared Processing & Analysis Center, with his first mission being with Stratospheric Observatory for Infrared Astronomy airborne observatory. 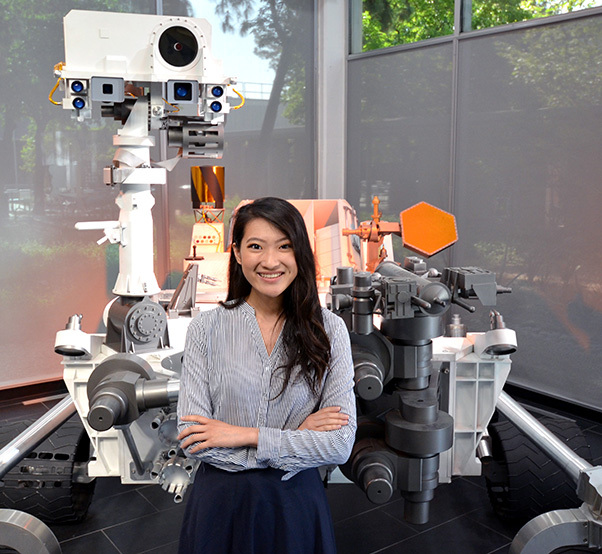 As for Seto, she is working as a data visualization developer for the Robot Sequencing and Visualization Program and also serves as a mobility and instrument deployment device downlink analyst for the Mars Exploration Rover operations. She is currently being trained to drive Opportunity, a robotic rover active on Mars. For others, the opportunity to become a part of NASA is nearly here. A new solicitation for proposals is planned for the upcoming months, where the MIRO activity will look for new proposals that have the potential to demonstrate a significant engagement with NASA’s current Mission Directorates.